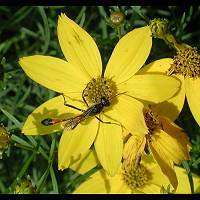 Digger Wasps are not closely related to the Spider Wasps, but behave accordingly. They are not very specialized and use all kinds of animals, mainly the larvae of insects , such as butterflies, moths, locusts and flies, but adults and spiders as well. These are paralyzed and then transported to the nest, often a self digged hole in the ground. Some of the better known Digger Wasps have a very characteristic body, and are therefor immediately identified as wasps. 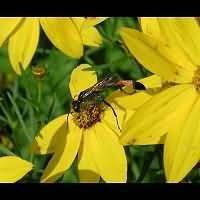 In our garden we see the large Sand Digger Wasp regularly. For the larvae may be meat eaters, the adult Sand Digger Wasps feed on pollen! This is a large species, that can be well over two centimeters in length. In the pictures a male feeding.